Kids love trains (and so do I), and kids love sorting. So it makes sense to combine the two to make the ultimate sorting flannel set! I initially got this idea when I was browsing iPad apps for kids. I don’t remember the actual app (I ended up not buying it), but one of the games consisted of children sorting different colored items into different colored train cars! Genius! Clearly, however, this is a popular idea because shortly after I saw the app, Katie posted about sound trains in her Growing Readers program! Since sorting trains are so popular, I’ve decided to go ahead and flannelize it. 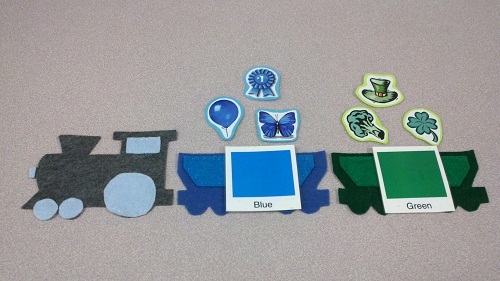 I made the train set out of felt using this train template from Mel’s Desk (I enlarged it just a bit). I then printed off and laminated various clip art for the children to sort. Right now I only have a colors set, but I plan to make all sorts of sets for this: letters, numbers, shapes, animals, etc. K Leigh is hosting this week’s Flannel Friday. To view past Flannel Fridays, you can stop by either the Flannel Friday website or the Flannel Friday Pinterest. We also have a Facebook page! This is beautiful. I agree that the kids love trains and sorting is very cool. No doubt this will be a hit. I just love this. I never thought to look at apps for ideas. Now, I will! What a great idea!! I am so excited to use this idea myself!